This post is sort of a follow-up to a previous post with a similar thesis: that the 60s and 70s aren’t dead, they’re alive and well and living on tumblr. These photos of geodesic dome interiors and exteriors are just a small selection from randomfriendly, nomadicway, julesandnicho, standardgrey and cerebralmuseum. Curious fact: Buckminster Fuller was not the inventor of these structures. The first geodesic dome was built 30 years earlier “by Walther Bauersfeld, chief engineer of the Carl Zeiss optical company, for a planetarium to house his new planetarium projector,” according to Wikipedia. However it was Fuller’s utopian PR for his domes that fed these 60s and 60s-style experimentations. Welcome to the pleasure dome – though I’m sure these are not what that song is referring to. The above by standardgrey really made me laugh, even despite an allergy to lolspeak (click on photo to see other amusing judgments passed on this thing). So many of these glass domes were eventually painted for privacy and shade, but this one takes defeating the purpose to a new level. 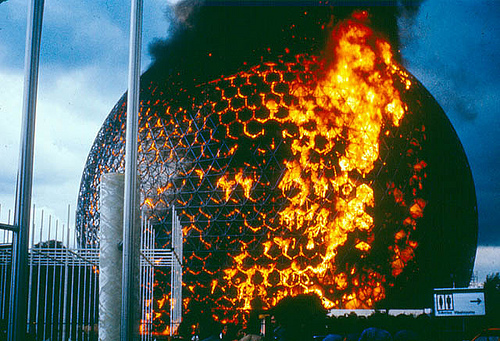 The 1976 dome fire below, “Buckminster’s blaze,” is via standardgrey via mcslo and is originally from the Montreal City Archive. See some funny remarks about this, and about domes in general, here. PS. check out this Buckminster Fuller collapsing table. This entry was posted on Thursday, May 28th, 2009 at 6:42 am	and is filed under design. You can follow any responses to this entry through the RSS 2.0 feed. You can leave a response, or trackback from your own site. This is such a fantastic post! That blazing dome will stay with me forever. You have a brilliant blog.